Instagram isn't the only app out there. For those under the tyranny of OOTDs, we discovered a few shopping applications that make life so convenient. Cloth. When stocking your wardrobe. This is the app that would make Cher Horowitz proud (and shriek!). It’s a system that stores your OOTDs and categorizes them into groups like brand, mood, color, and weather. Speaking of weather, it also has a real-time function that can even suggest what outfits would be best for the day’s forecast. How cool is that? Basically, the app is where you should post your full-body looks, not for Likes, but for you to monitor when and where you’ve worn a certain outfit and to share and take inspiration from other users. Co-founder Wray Serna says it’s a great way to fill in your wardrobe gaps—so you know what else you should and shouldn't buy—at the same time allowing you to maximize the cost per wear of all the items in your wardrobe. If you’re an art noob trying to impress a certain someone (or a blogger seeking backgrounds for your outfits), we suggest you download Artifact. Carefully curated by Michael Benedicto, the art newbie guide contains a list of our local artists complete with brief bios, their works, and schedules of upcoming fairs. You can even inquire directly with any of the 18 galleries the app is currently connected with. LIKEtoKNOW.it. When "window-shopping" on Instagram. A function rather than an app per se, Like To Know It helps you shop those pieces you’ve been ogling on Instagram. 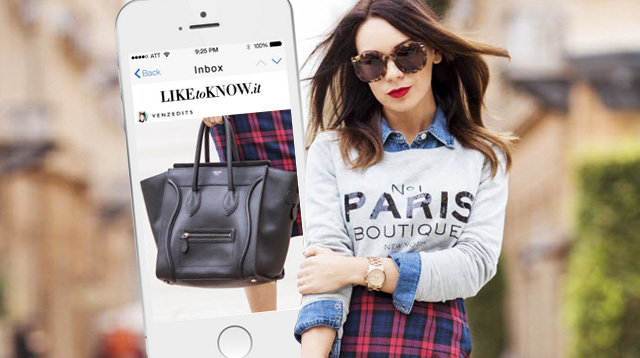 Sign up on their site and as long as that blogger you’re stalking has an account tagged with #liketk.it, you can like the photo, and immediately get an email with product details and shopping links. They have over 4,000 fashion retailers and 200,000 beauty brands, so it works for flatlays as well. Guys, even Coco Rocha's on it. With all the purchases you’re bound to make with the programs above, you'll need something to keep you in check. It will help you track your expenses (given that you diligently input them) in a visual manner that will surely make you realize what you should spend more or less on. Priorities, priorities!